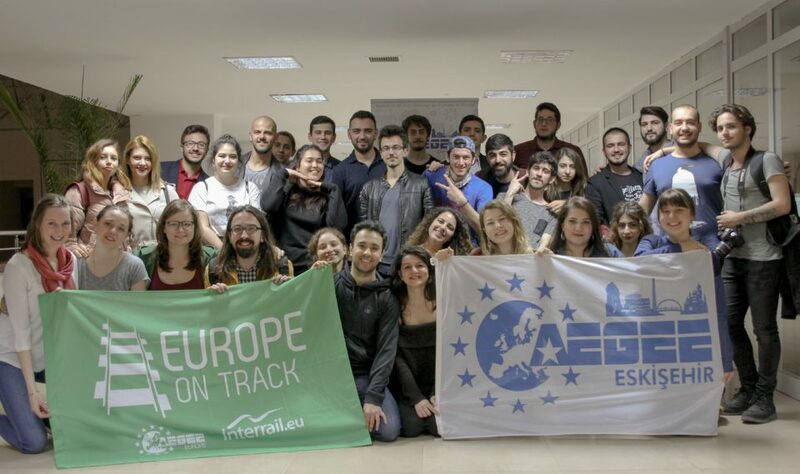 From the 23rd to 26th March, team red went to visit AEGEE-Eskisehir for its first stop. They had a great time there thanks to those insanely nice people. Those three days entailed workshops, city tours, meetings, and of course super tasty food. This was short but enough for the ambassadors to deeply bond with this amazing antenna. After nine intensive fun days in Thessaloniki with the nine ambassadors and members of the project team of Europe on Track 5, the time came to say goodbye to all those amazing friends. This emotional and hard moment marked the start of a new adventure; the beginning of the red route! Our bus for Turkey was scheduled at 10 pm which gave us a last opportunity to enjoy a delicious falafel gyro. We arrived safe and sound in Istanbul in the early morning. However, we had not reached our first stop yet and still had to take the high-speed train to Eskisehir. We finally arrived around 4 pm on the 23rd March, and we could not have been more excited! We went down the escalator to find members of AEGEE-Eskisehir patiently waiting to greet us. Our first workshop was already scheduled for that evening, so we directly left to put our luggage to our hosts’ places and went to the office of AEGEE-Eskisehir on the university campus. At the office, the members offered us such a warm welcome that our anxiety about the deliverance of our first session directly fed away to leave us only with excitement and motivation! As you probably know, the topic of this year’s edition of Europe on Track is ‘Sustainability and Climate Change’. Therefore, all the ambassadors have worked on the creation of interesting and interactive workshops aiming to raise the awareness of young people and inform them on such stressing issue. We chose to start with a workshop on environmental sustainability, which is the limiting pillar of sustainability, as natural resources are scarce. During this session, we primarily mentioned various current environmental issues and stressed the key role of environmental sustainability in tackling them. 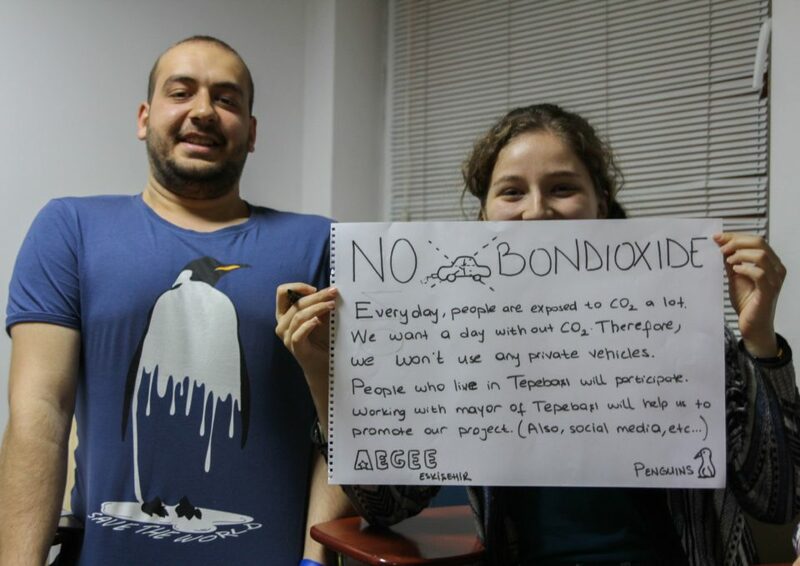 Afterwards, participants had a lot of fun creating campaigns aiming at making Eskisehir greener. They came up with creative projects to tackle car pollution and to put incentives on campus for more efficient recycling. Our second workshop aimed to inform participants and foster discussion between them on the lack of sustainability within the food industry. Our participants notably learned a lot regarding the intensive use of water, the release of greenhouse gases, the deforestation process, and waste accumulation during all the life-stages of a product. Many left the workshop very motivated to change their food habits to decrease their ecological footprint. Finally, for our last workshop, we discussed the social pillar of sustainability. Our goal was for participants to understand that for people to adopt a responsible thinking in line with sustainability, we must tackle social inequalities and injustices. We must ‘think global, act local’. The atmosphere in Eskisehir is amazing. The city has a lot of places to socialise, it is safe and the walk around the Porsuk River is particularly pleasant, also because it is a way to escape the dangerous traffic of the city. Have you ever been to a fairytale castle? Well, we have! On the 25th – which happened to be the international fairytale day, AEGEE-Eskisehir took us to Sazova, a famous attraction park outside the city. 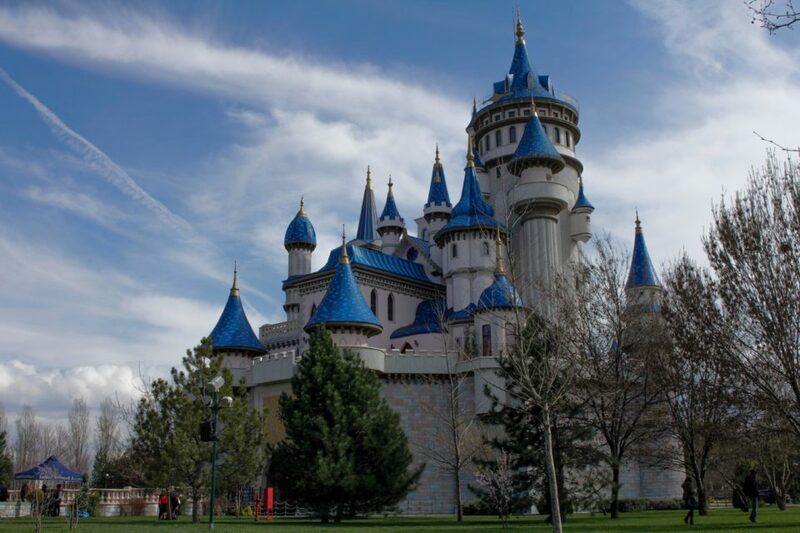 The interesting part about this castle is that its 9 towers are reproductions of the most famous towers of Turkey, among which four are from Istanbul. 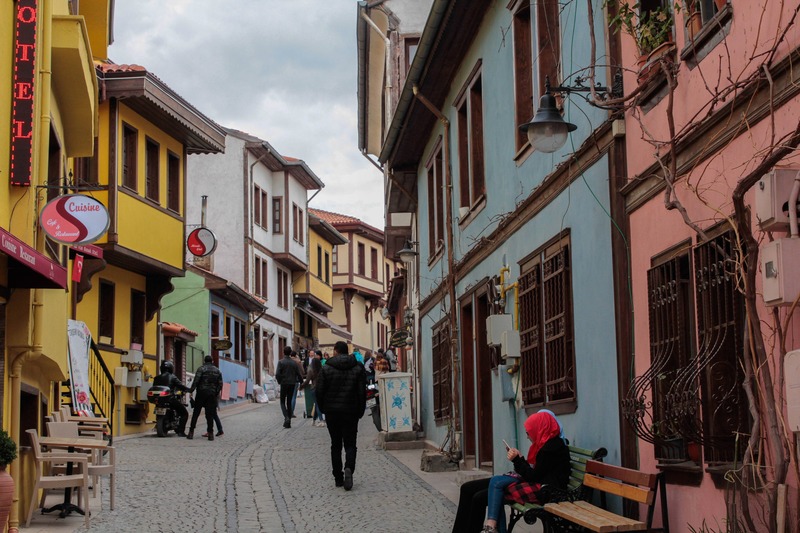 We also went visiting Odunpazari, the old neighbourhood of Eskisehir, which was very colourful, and full of little shops selling art-work and jewellery made of lûletaşi (a special white stone of the region). In Odunpazari, we stopped in a Crimean restaurant to taste a couple of their çibörek, a popular dish in this neighbourhood due to the large Crimean expatriate community. During our stay, we also had the opportunity to taste other famous dishes such as manti, gözleme (salty crepe), and pide (Turkish pizza). On the 24th morning, AEGEE-Eskisehir even invited us to share a Turkish breakfast full of incredible food. 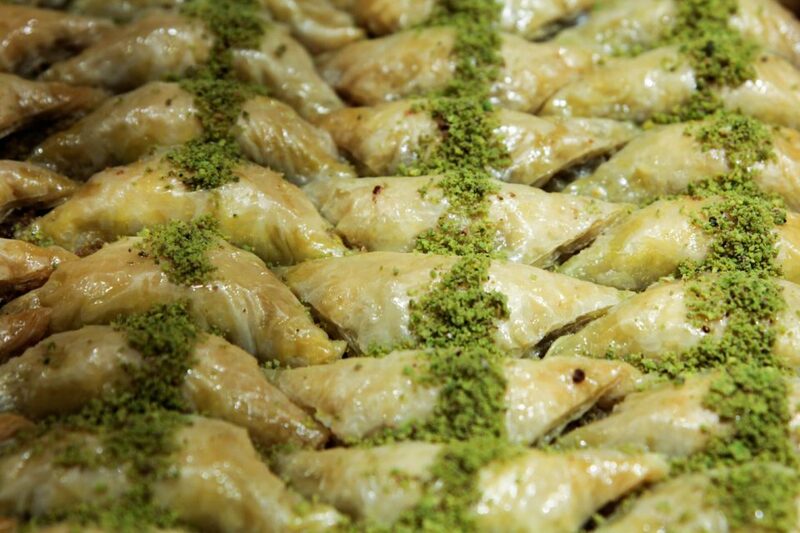 However, our favourite of all is without hesitation the baklava, which is a kind of desert with pistachio pasta. For our outdoor session, AEGEE-Eskisehir brought us to a ‘food-transforming and second-hand market’ organised by the NGO Ustünüze afiyet. This association came to existence after a three-year local grassroots project aiming to give young people the opportunity to be change-makers in their community. We had such an amazing time during this first stop and we cannot thank AEGEE-Eskisehir enough, especially our awesome hosts Sinan, Gül and Gürkan for their great hospitality and for taking such good care of us! We are also thankful for your free Turkish lessons. Teşekkür ederim! Seni seviyoruz (okay I admit, that one is from Google translate). See you somewhere in Europe! Wish to see more pictures of our fourth stop? Check out our album here! Written by Aliénor Pirlet, Photos by Marie-Claire Graf.